Next in line the flagship sees more advanced applications starting to appear after 2022 - such as solar cells and flexible perovskite panels, supercapacitors, water treatment, neural interfaces, and flexible devices. 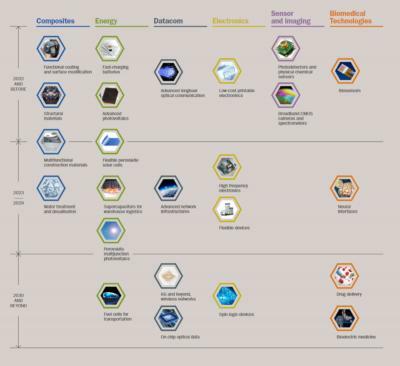 In 2030 and beyond, the flagship sees graphene related materials being adopted in drug delivery, spintronics devices, wireless network, fuel cells and more. If the graphic were legible, even in the embiggened version which is fuzzy rather than antialiased for its own reasons, it would be a thrill! C'mon, graphene-info, curators of graphene, you can get this.